" 'Cause I am everyday people." So here's the thing. I intended to post a photograph that embraced the acceptance and tolerance of each other, that this song preaches. It was going to be no less than earth shaking poignant. Due to the amazing photographic talent AND insights, it probably would have boost my "followers" on this blog past that elusive 300 watermark. But, something unexpected happened this past week that made me realize how an everyday person...can make a dream of mine come true. So change of direction. Course altered. "Followers" will probably stay at 295 with this post. But that's okay because I'm pretty sure someone up in heaven is pulling strings for me. And that's kinda more important than a popularity contest (at least for today). My story in CliffNotes version. I come from a family that did not have a wealth of material things growing up. Far from poor, far from rich....right smack in the middle. EXCEPT for Christmas morning, which was over the top fabulous in it's decadence. But when it came to the other 364 days of the year, it's been a long standing "joke" that the only thing my sisters and I truly cherish materialistically from our parents is...a creche. Not just any creche. But a creche that was brought over from Germany by my great grandmother Hagenmeyer. FIVE of them (that I am aware of). One for each of her grandchildren. Which was my Pops, and his four siblings. A Goebel Hummel 1952 creche. 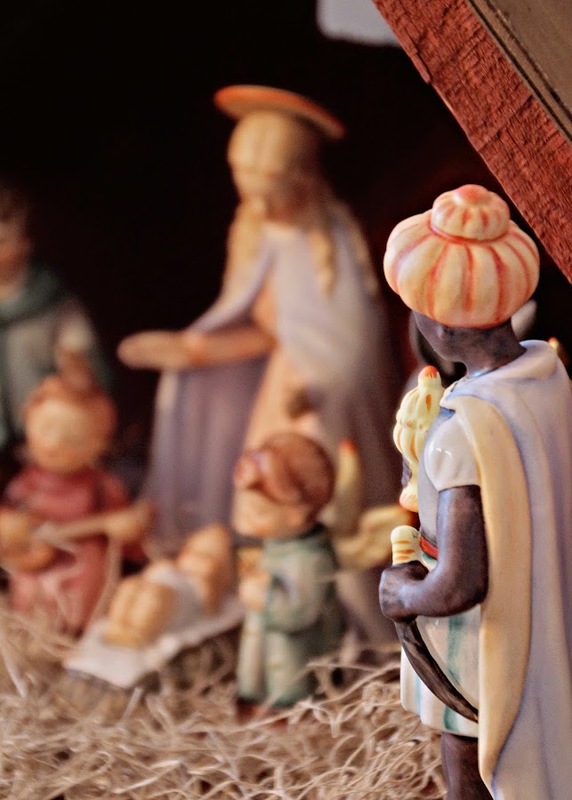 In my eyes it is perfection when it comes to Nativity scenes. Dream like, fairy-tale like, ethereal like, I wish it were mine...like. 50+ years and I have yet to see another creche that pulls at my heartstrings like this one. I am not a collector of Hummels. Yes, they are cute. No, I don't want to have to dust them. I don't really collect much of anything besides shoes. 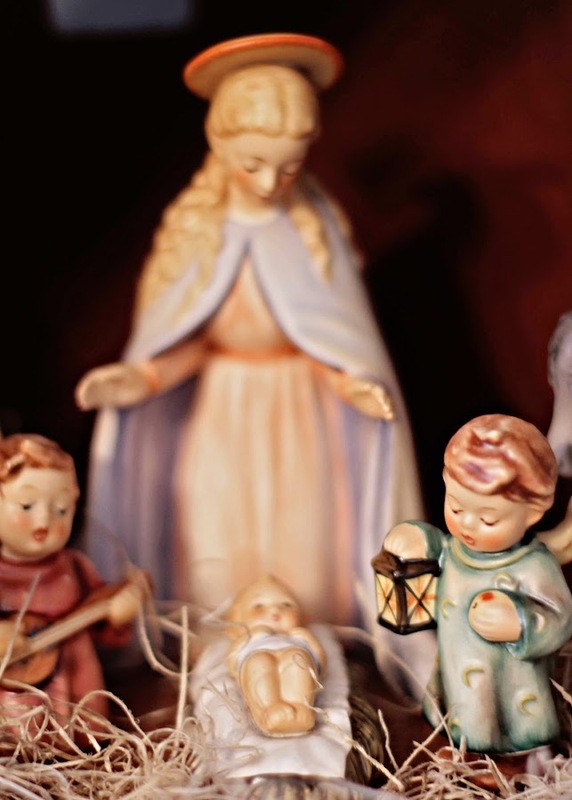 But the creche is a wonderful childhood memory, and full of family history. That's what makes it precious. And priceless to me. 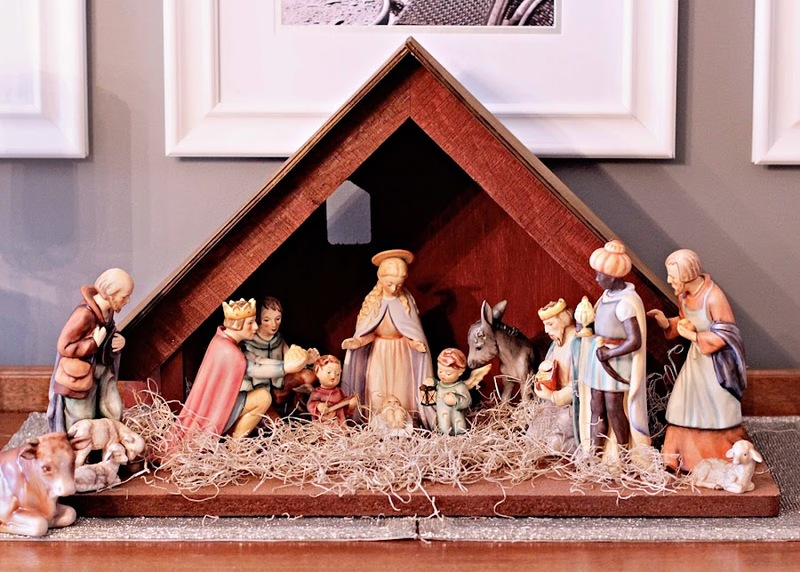 Every Christmas season the creche box would get pulled out. Mom would carefully unwrap all the Hummel pieces, hand them to us. And we would decide where each piece would be placed. Then we would carefully place in the "straw" (which was the packing contents of the box). The Holy family, the angels, the Wise Men, the Shepherd, the cow, and my favorite...the donkey. Of course, somehow the pieces magically got "re-arranged" when we left for school. Yes mom and dad...I noticed! But three daughters? Three highly competitive daughters? And one creche? I always held firm that the eldest should inherit this treasure. Fact...it is the only time I ever admit to being the eldest of anything. But my parents always remained non-committal. Which totally ticked me off. My dad was a judge for cryin' out loud! Yet he couldn't come up with a verdict on THIS?!? Over the years I have kept my eye out for a duplicate creche. But seriously...1952? Hummel? What are the chances I could find an identical one AND at a price I could afford? Pops passed a couple of years ago, and the creche his grandmom gave him became increasingly important for me to have. It was a piece of him. A piece of our history. Chock full of memories. Last week, I was trying to unload sell a bunch of the wedding decorations I had accumulated over the past year via a "virtual yardsale" online. And there posted amidst my picture frames, candle holders, lanterns, table cloths, chalk boards, yada, yada, yada...was MY creche. Goebel Hummel 1952. Posted by just an everyday person who had no idea they were about to make a dream come true. And at a price that wasn't going to require a second mortgage (you're WELCOME Better Half!). It was brought over to America from Germany by HER grandmother. And this is the part of the story that makes me abundantly certain that there were some strings being manipulated from up above for me. The everyday person who was selling this creche? She lived a few streets away from me growing up AND...she's worked at the local police department for 30 years, and knew my dad, da judge. She asked me "Are you Judge McIntyre's daughter?" Normally a question that instantaneously struck fear in my heart when asked during my teen-aged years. But this past week? I take it as a sign from above. So I now have in my possession a 1952 Goebel Hummel creche IDENTICAL to the one my great grandmom Hagenmeyer brought over from Germany for her five grandchildren. I unpacked this baby, and have arranged, and rearranged, the figures daily. Since I've now willingly removed myself from the WorldWarCreche, I can't wait to watch my two sisters battle it out. May the odds be forever in your favor McIntyre daughter #2 and #3. As for me? Mucho thanks to the everyday person who eliminated me from that cut-throat competition. disclaimer: no blood has been shed in WorldWarCreche (that couldn't be remedied by a Band-aid). What a beautiful story Kathy. Someone is looking out for you for sure. Enjoy your treasure! It is true, it is the little things from our childhood that our hearts remember and cling to. Enjoy your creche during this season! Congratulations on your beautiful find. It'll be even more special since it comes to you, angst-free! It's lovely. Score you. I have 300 Hummels (most still in boxes in the attic nearly eight years later!) left to me by a great aunt. No Creche though...or else I may have been able to work a deal with #2 or #3. How sweet is that!! Gorgeous set for both of them! Love the photos, love the story, love the happy ending! Amazing. This is such a cool story. I am so happy you found it. I have a similar thing with a clock my Mother has that was my Grandparents... but I am slightly more advantaged than you as I am an only child! What an amazing find! Lucky you! really late getting around to visit - but what an amazing stroke of luck and a fabulous find. Glad you are out of the mix for the family set.